Sometimes good old ls just doesn’t cut it when you’re browsing directories from the command line. Sometimes you just need a more visual overview of the nested files and directories. Well, it turns out there’s a useful command for those cases, and it’s available for Linux, OS X, FreeBSD and just about any OS you can think of. (Except Windows, of course.) It’s called tree. Is that cool or what? This should be quite useful for writing tutorials, since a plain-text directory tree is more accessible than a screenshot of a file manager window. cURL is pretty much the universal go-to tool for testing HTTP responses from the command line. If you’re not already familiar with it, here are a few handy things you can use it for. You can use cURL to see the headers sent in a request. I use this all the time to see if the headers I’m trying to send in a script are working right. I was working on a project recently that involved receiving POST requests from a client script running on another server. Since there was no convenient HTML form to use to repeatedly test changes made to the API, I ended up using cURL. Sending POST data is a simple matter of passing an argument that looks something like a query string. Mac users with custom entries in their /etc/hosts files may have noticed that, under Mountain Lion at least, lookup times for local resources are incredibly slow. I routinely set up names that point to virtual hosts on my laptop so I can give projects their own local domain instead of having http://localhost/projects/something/index.php or somesuch. Typing something.dev is much easier. I noticed that, since upgrading from Snow Leopard to Mountain Lion, Firefox would spend several seconds trying to look up those names before consulting the hosts file and loading the page. While I don’t know why it’s happening, exactly, I do have a fix. The wait goes away if you put the local entries on one line. Leave the lines that say “localhost” alone, of course. Messing with those could cause all manner of Bad Things. Starting in OS X 10.5, Apple introduced the handy Quick Look feature, which of course enables you to preview a file by tapping the spacebar. If you’re like me, you probably use it regularly for quick glances at files that you don’t really need to open in your text editor. But it lacks one thing, one thing that makes reading long source files bearable: syntax highlighting. I can’t believe it took me so long to find it, but there is an extension for Quick Look that adds color coding to source files in most common languages. QLColorCode, as it is called, is compatible with every version of OS X from Leopard to Mountain Lion. You just drop the .qlgenerator file into ~/Library/QuickLook or /Library/QuickLook and enjoy your improved Quick Look functionality. Users of Espresso and CSSEdit have been complaining for some time about the lack of updates to the software. In a surprise announcement, MacRabbit (the developer) announced that Espresso 2 is on the way and that CSSEdit’s functionality is being rolled into it. The long wait has grated both on our own nerves and those of our awesome users. But while we have kept quiet publicly about what we are working on, it is because privately we have been striving to transform our products into something new and even more awesome: Espresso 2. We are extremely excited to finally be able to show you what we have been working on, as this release will be of interest to both CSSEdit and Espresso users. An early preview, the “kaboom” release, is already available for testing and upgrade path information has been posted. 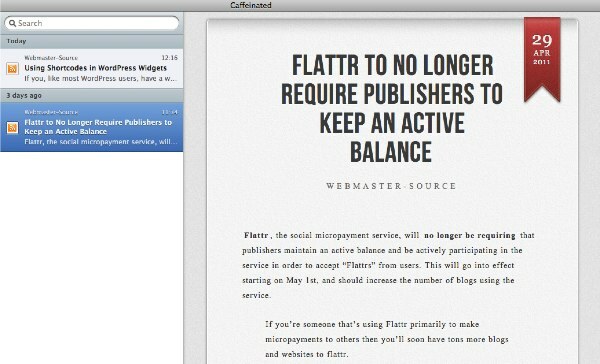 A couple years ago, I heard about an interesting Mac RSS reader in development. Caffeinated, as it was called, sounded like a good alternative to my current feed reader (NewsFire). There were some neat screenshots, but the software was nowhere near ready for release. After much waiting, the developer has finally released a beta of the application. It’s very fast, taking only a couple seconds to launch. The interface is slick, particularly the pane that displays the current feed item. Caffeinated does a very good job at formatting the text and resizing images to fit cleanly into the content. Of course, Reeder is also being beta tested now. Since news of Caffeinated started circulating around the internet, some competitors have shown up. Reeder, in particular, stands out. It will be interesting to see which app comes out of beta first, and how users react. 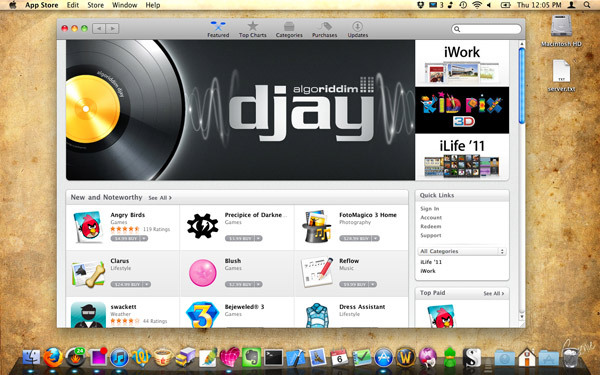 Apple just launched the Mac App Store yesterday, bringing with it a welcome surprise. The much-awaited Tweetie 2 for Mac is finally available, in the App Store, under the new name of Twitter for Mac. I’ll get to that in a little bit, though. Let’s take a quick look at this App Store that everyone has either been impatiently waiting for or relentlessly fear-mongering about. There it is. The Mac App Store has launched with a good selection of applications, and their prices range from free to reasonably priced to, on occasion, absolutely bizarre. There are plenty of wonderful free apps, such as Evernote, TextWrangler, Caffeine, StuffIt Expander, and Twitter. There are hit games like Angry Birds and Bejeweled 3. Here’s the strange thing: LEGO Harry Potter the Videogame (from the same folks who made the fun LEGO Star Wars games) is available in the App Store for a whopping $49.99. Meanwhile, you can get it for Windows XP for about $20 on a disc. They’re charging about twice as much for a fully digital version. I don’t quite follow that logic.